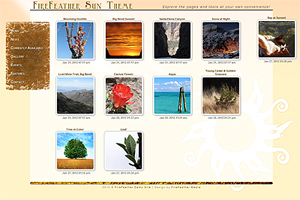 SkyStudio portfolio is a comprehensive software solution for those looking for a simple website to exhibit artwork, crafts, hobbies or showcase a few products without wanting to support a full storefront. Each section contains powerful tools to fully control your pages, including detailed controls for your galleries and a schedule of events. Many people use this schedule of events to share events they will be attending, either as a vendor or just a visitor. This is the most basic of the SkyStudio Suite and suitable for any of the above cases or someone just wanting to start out with their own website on the Internet. Link to your social media account by entering links to your Facebook, Twitter, Tumblr, LinkedIn and/or Skype accounts. Create and manage multiple administrator accounts to allow permanent or temporary access to others. For a demonstration of this software, please see the SkyStudio Portfolio Demonstration page. If you are in the Hill Country region, please contact me for a demonstration appointment!